For centuries, the kitchen was the main focus of your life and a central location for the family. Fireplaces and ovens brought warmth; the kitchen was traditionally the only heated room in a house. Then things changed – technical progress and industrialisation reduced the importance of the kitchen. Because it was suddenly warm in the entire house. Today, we are celebrating a renaissance of the kitchen as a living space. And now planners and developers are also rediscovering the kitchen as a living room. The keywords that come to mind are multi-functionality, openness and experience space. The new desire for cooking is just one indication of the fact that in our stressful world, people are re-developing the need to spend time together. The kitchen is back at the heart of things. This is nice – but there is also a problem. If the kitchen is to become a living space and place of well-being, the space requirements must also be dealt with. In other words, you need space, or a good idea. A modern and functional kitchen island that can do somewhat more. For Häfele, functionality is never an end in itself. During the course of designing a space-saving kitchen solution, our developers therefore mainly wanted to discover an authentic demand and conform to it. The goal of the considerations was a modern and functional kitchen island that can do somewhat more than you first expect. When the idea for the kitchen island came up, the design was first developed and then it went into the detailed planning phase. The big challenge was to accommodate as much as possible with full functionality – such as electronic devices, storage spaces and worktops. There was also a need to make desire become reality in a meaningful and delicate way. Hurdles had to be overcome in order to introduce all of the fittings ergonomically. For example, when the large table didn’t want to fit into the cabinet, millimetre precision and a masterly performance from the Häfele joiners were required. Finally, all of the fittings were installed and the kitchen island could be completed. Working with millimetre precision to create the finished kitchen island. 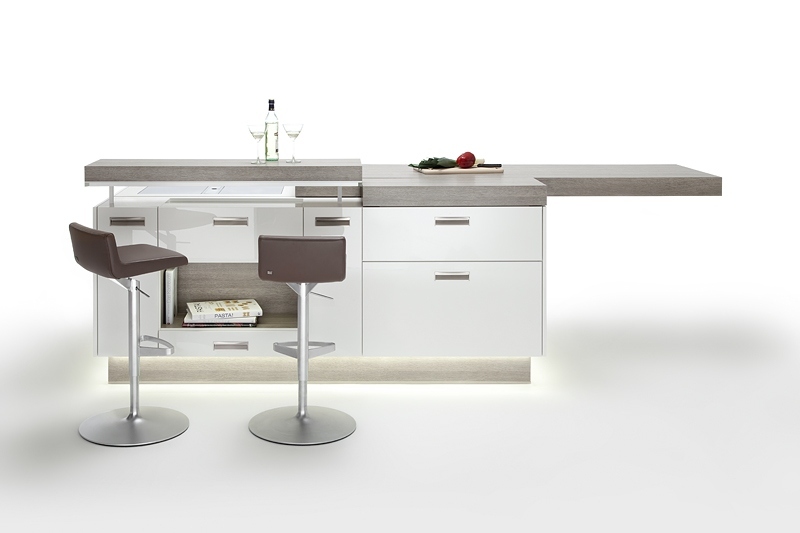 The kitchen island is ideally suited for homes where little space is available. It leaves nothing to be desired and surprises with its great features: dining table, extendible work-top, with a hidden hob with a fully retractable extractor fan underneath, plinth lighting, plinth drawer, storage space for cutlery, dishes, pans, place mats, books and a bottle pull-out. Time for a summary: The kitchen island principle has been successfully implemented and works. Häfele has proven that a cosy and fully functional kitchen is possible, even in small spaces. Life can therefore return to the kitchen. The kitchen for this already exists.